For the second consecutive week, Jamie Callahan has earned recognition as the SoxProspects.com Pitcher of the Week. 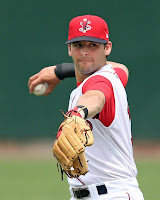 Greenville second baseman Reed Gragnani (pictured) becomes the first member of the 2013 draft class to win SoxProspects.com Player of the Week. Callahan pitched six perfect innings in his lone start to win both this award and the New York-Penn League Pitcher of the Week for the second straight cycle. Against the Auburn Doubledays, the right-hander struck out 9 of the 18 batters he faced, breaking the career high that he had set the previous week. Gragnani, a 21st-round pick out of the University of Virginia, has been one of the standouts of this years class. In early July he became the first player the Red Sox drafted in 2013 to reach Greenville, and now he becomes the first Player of the Week winner. In five games, Gragnani hit a stellar .444/.500/.611. He also launched his first professional home run in the July 30 contest against Greensboro. Notes: Mike Augliera won the Carolina League Pitcher of the Week for the second consecutive week and the third time in the last five. Owens made his Double-A debut during the week.